The effect of recent climatic warming is significant in the Mediterranean region, especially in high-mountain areas. This study uses multiple sedimentary proxies from Río Seco Lake, a remote alpine lake in the Sierra Nevada, southeastern Spain, to reconstruct recent environmental and ecological changes in the lake and catchment. Two main climatic periods can be distinguished during the past 180 years: Period One (1820 to ~ 1920s) characterized by colder and wetter conditions than the more recent Period Two (~ 1920s to the present), characterized by warmer and drier conditions. Independent proxies such as subfossil chironomid assemblages, n-alkane indices, pollen data and/or spectrally inferred chlorophyll-a concentrations indicate a longer ice-cover period, colder water temperature and more pronounced accumulation of snow in the catchment during Period One than in Period Two, likely producing water stress for catchment plant growth because of the low rate of ice melting in Period One. As temperature increases and precipitation decreases from the 1920s onwards, a wider development of wetland plants is observed, which is associated with the longer warm season that contributed to snow and ice melting in the catchment. This continuing temperature rise and precipitation decrease over the past 60-years by ~ 0.24°C per decade and –0.92 mm/y, respectively, lead to an important increase in chlorophyll-a and changes in lake biotic assemblages. Major chironomid community structure changes to warmer water taxa were recorded, resulting in a 2°C increase in mean July air temperature inferred by chironomids from ~ 1950 onwards. 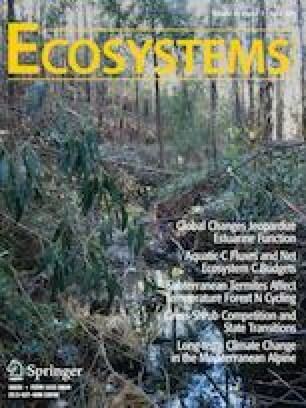 An inferred increase in primary production for the past few decades is consistent with higher temperatures, while wider development of wetland plants is associated with longer warm season. The coherence between independent environmental proxies, each associated with distinct mechanistic linkages to climatic shifts, strengthens our interpretations of a recent warming trend and an intensification of summer drought in this high-mountain area leading to distinct changes in the lake and its catchment. The impact of this climate change on the summits of Sierra Nevada and its influence transcends its geographical limits because these systems provide ecosystem services to a vast area. LJ and CP-M conceived or designed the study; LJ, AG-A, JLT, OH, RSA, JMCP and CP-M performed the research; LJ, AG-A, OH, JMCP and CP-M analyzed the data; and LJ, AG-A, JLT, OH, RSA, JMCP and CP-M wrote the paper. The online version of this article ( https://doi.org/10.1007/s10021-018-0286-5) contains supplementary material, which is available to authorized users. The authors wish to acknowledge all colleagues for help with fieldwork. We thank Paleoecological Environmental Assessment and Research Laboratory (PEARL) of Queen’s University at Kingston for processing the spectrally inferred chlorophyll-a record. This study was funded by MMA Project 87/2007 and MINECO Project CGL 2011-23483 to C. P.-M. and a FPU fellowship (AP2007-00352) to L. J. from the Spanish Ministry of Education and Science. A.G.-A. was also supported by a Marie Curie IEF of the 7th Framework Programme of the European Commission (NAOSIPUK. Grant Number: PIEF-GA-2012-623027) and a Ramón y Cajal fellowship (RYC-2015-18966) from the MINECO. Juggins S. 2012. Rioja: analysis of quaternary science data. R package version 0.9-9. Retrieved from http://cran.r-project.org/package=rioja. Oksanen J, Blanchet FG, Friendly M, Kindt R, Legendre P, McGlinn D, Minchin PR, O’Hara RB, Simpson GL, Solymos P, Stevens MHH, Szoecs E, Wagner H. 2015. Vegan: community ecology package. R package version 2.4-0. Retrieved from http://CRAN.R-project.org/package=vegan.